Have you ever been intrigued by the simplicity of country-life, but are too skeptical to try it out? Well, experience it with us, without giving up on comfort. Enjoy the sweet slow life while relaxing in our spacious, but cosy rooms. Sit by the lake and read a book or enjoy a lovely dinner as a gentle breeze sweeps over. 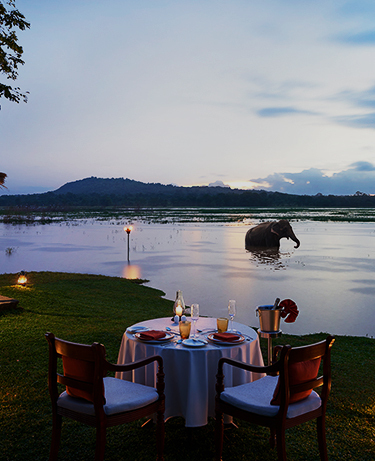 When you feel like stepping out, cultural havens like Anuradhapura and Polonnaruwa. Get a close glimpse of rustic authenticity with a short trip to the surrounding village, and learn a thing or two about the simple joys of life. A village has its own way of uncomplicating life, as we know it. So, when you pick Habarana Village by Cinnamon as the location for a meeting, expect it to bring about the simplest solutions to the most complex problems. When two souls decide to commit to each other for a lifetime, it changes them as individuals. Here’s a space that has the same effect. The rustic setting, with the rustling leaves and a cool breeze by the lake, stirs up an ambience that elevates the soul in every sense. A rustic vibe, by a lovely lake - wish to dip your soul into it? Just like your better half takes up all your heart, the warmth of this space makes you all fuzzy. The winding pathways that lead to the rooms, the garden area with trees that are lit with lanterns in the evening, the soothing sounds of the rippling lake – you get the picture. Enjoy the warmth of the rustic atmosphere at your Poruwwa ceremony by a rippling lake. Trust the presence of the traditional performers to elevate the ambience.